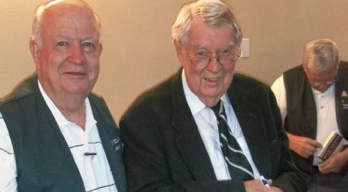 The October dinner meeting of the Cotton Mission Chapter featured author and historian Douglas Alder. He told us the fascinating story behind his new book “Dixie Saints.” The book tells the story of everyday life in Utah’s Dixie during the early part of the 1900’s from the perspective of the people who were there. The book focuses on the “third generation” of Dixie Saints, mostly born in years between 1890 and 1910. Ralph Atkin, Chapter president, with Dr. Douglas Alder following Dr. Alder's remarks. Personal stories were gleaned from 425 personal interviews, recorded by Fielding Harris, which sat idle for many years until Dr. Alder was offered them. Initially, he was able to get the tapes safely into special archives but it wasn’t till after his own retirement that he had time to fully examine them and set about to get them published. A number of people were recruited to do the transcribing which was not completed until many years later in 2013. That is when Alder began delving into ways to make the stories into a book. Dixie Saints tells the stories of the common folk who lived in Utah's "Dixie": the farmers and the ranchers, the fruit peddlers, the road builders, the timber cutters and lumber makers, the freighters, the midwives, the mothers and child nurturers, the teachers, the choir singers and band players--those whose names are on genealogy charts but seldom in the history books. These people weren't considered pioneers, because they were of the second generation in the area, but they worked hard and helped hard and helped to lay a foundation for thriving communities. This book consists of interviews conducted with people born between 1880 and 1910 who grew up in southwestern Utah, the Arizona Strip, and the Muddy River region in Nevada. The excerpts are divided into seven topical chapters: family life/childhood/teenage years, school, work, health and sickness, Mormon colonists in Mexico, interactions with Native Americans, and service. In his introductory essay, the author offers 15 overarching observations based upon the interviews. These furnish a valuable collective portrait of life on the fringes of Mormon society early in the twentieth century--a time period that has been largely overlooked in the social history of Mormonism.